The best game featuring some of Kenshiro’s adventures to date and also one of the most fun. I can take some pride in saying I’m one of the biggest fans of Fist of the North Star out there, as I fell in love with the story and characters ever since I watched the anime movie more than two decades ago. I’ve also had the pleasure of watching the entire 152-episode series on top of that, and have played most of the games based on the famed franchise over the years, some good but most being so-so. That’s not the case here with Sega’s third take on series (the first being the edited Black Belt on the Master System and the edited Last Battle on the Genesis) with Fist of The North Star: Lost Paradise. If you’re a fan like me and/or love beat-em-up action games, you’ll want to see what this shining star is all about. For those hiding under a rock or weren’t born in the 90’s at least will have no problems with getting into the story, as it serves as a nice stand alone piece from the manga and anime, though it borrows elements from both. You play as a martial artist and probably one of the baddest anime characters of all time named Kenshiro, a cool guy that as is powerful as he is kind. He travels the post-apocalyptic land helping others he comes across while also searching for the love of his life, Yuria, who is lost out there thanks to his former best friend Shin stealing her from him. Once you’ve mastered the basic attack combos and the bloody but sweet finishing moves Kenshiro can pull off, it falls on you to help him in his quest as he makes new friends and enemies in the process. Anyone who is a fan will be more than happy to know you can pull off any of Kenshiro’s signature kill moves from the anime and manga, from the well known “At-ta-ta-ta-ta” rapid punch skill that’s absolutely mind-blowing (couldn’t resist the pun), to all of his others as he jabs fingers into enemies’ pressure points with bloody and explosive results. Yeah, you’ve probably gathered by now this isn’t a game for kids or the faint of heart as there’s a lot of blood and body parts flying around when Kenshiro gets ticked off. If that wasn’t enough, you can also pull off a super technique that causes Kenshiro to go shirtless as in the manga and anime series, and do even more damage and painful moves. There’s also a skill tree system in place where you can unlock new abilities and power up the ones you have as you decimate anyone who stands in your way. Another cool thing that makes this combat system amazing is that it was worked on by the same team behind the beloved Yakuza series. So you’re getting buttery smooth, 60 frames per second gameplay with some nice graphics and sounds to boot. There’s even a free DLC that lets you play as Kazuma Kiryu from the Yakuza games for those who want to take this even further. Speaking of the Yakuza games, this title also borrows a lot from them in the form of being able to explore the cities you come across. Here you can go inside shops, bars, and more to play cool mini-games (Kenshiro mixing it up as a bartender, yes please.) and do all sorts of neat stuff to take the edge off exploding people’s heads. 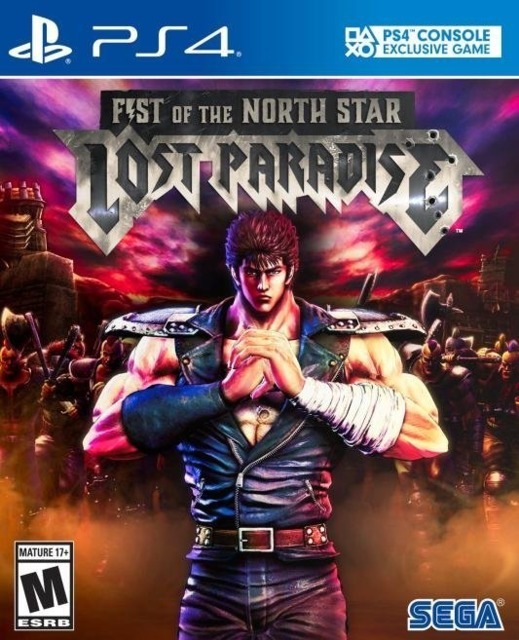 I could go on all day and night being a fanboy, but I’d rather you play Fist of The North Star: Lost Paradise for yourself and see how awesome it is. Fan or not, you’re bound to have a fun time making bad guys burst to pieces and checking out all of the sweet mini-games and side stuff you can do. So come on and get lost in this paradise, as you’ll have an explosive time indeed.